Are canoes and kayaks the same? This is a question that many people have asked at one point or another, but actually, they are not, even though the two are often confused and even used interchangeably. Despite how people use the two terms, canoes and kayaks are really quite different from one another. Each has its own origin, design specifics and functions, including the way the two watercrafts are propelled. In this article we will describe the canoe and kayak in great detail, highlighting the similarities and differences of each as we explore their history, design, functionality and more. But before we delve into the major differences between the canoe and the kayak, here we will first go over the history and basic design of each vessel, before comparing their primary functions. Canoe versus Kayak: What Are The Main Differences? These rudimentary watercrafts were utilized by the Carib Indians of the islands of the Caribbean. They were originally made from large to enormous tree trunks that were hollowed out and ultimately shaped, making them strong enough to travel between the islands for the purpose of trade. These waterproof vessels were ideal for traveling from island to island and opened up markets not previous available. In North America, the native tribesmen used these large canoes to travel via water rather than land. They also used them for early fishing vessels—vessels that had improved dramatically since the early models made by the Caribbean tribes. The North American tribes-people are responsible for creating a more modern version of the canoe as we know it today. These canoes had a frame of wooden ribs that were primarily covered with the lightweight bark of birch trees, as well as that of cedar and elm trees. These innovative vessels, which remained basically unaltered for thousands of years, proved themselves as being ideal watercraft options for traveling the abundance of waterways in North America, including lakes, rivers and streams (the lighter weight of the birch bark made the primitive canoes much swifter and allowed them to carry much more weight than earlier designs). The improved design of these canoes allowed them to be extremely helpful in the late 18th century and early 19th century—a time when the lucrative fur trade had drawn many people from foreign lands to the banks of the New World, particularly the French in what is now the Quebec region of Canada. The bark from the birch trees was found to be the most ideal material for canoes. Not only was birch-wood bark lightweight, it was also smooth, durable and surprisingly waterproof. The birch tree could also be found in almost every area of present-day Canada, save for the subarctic region. In this region, spruce tree bark was often used as a substitute for birch bark. The joints of the canoes were connected and held together by white pine tree roots; and those joints were made waterproof by heating pine and spruce resin and applying it to where the bark came together. The history of kayaks is different from that of canoes mainly due to the region in which they came into prominence and the materials used to make them. However, both types of vessels were created for the same reason: a need for transportation on waterways for the purpose of hunting, fishing, trapping and more. Kayaks were also invented by early native tribes, specifically those that inhabited the northern, frigid regions of Alaska, the uppermost part of Canada and Greenland. These tribes included the indigenous Eskimo and Inuit people, as well as the Kalaallit tribe of Greenland. Early kayaks were made from whatever materials were available for construction, including whalebone, driftwood, seal skins, and animal hides. They were made waterproof by using layers of rendered down whale fat and applying that fat to the joints of the kayak. The Kayak was introduced to Europe in the mid-1800s. By this time, it had evolved into a fabric covered frame boat, and kayaking as a sport began to grow in popularity in the Western countries of Europe. Of course, the kayak also retained its usefulness as a boat to navigate through narrow and icy waters. Many explorers carried kayaks with them on their expeditions to the North and South Poles as a way to navigate through ice floes and partially frozen rivers. The first recorded instance of using a kayak for whitewater running came in 1931, when a German named Adolf Anderle became the first person to kayak down the Salzachofen Gorge. The International Scale of River Difficulty was established not long after to classify how dangerous a river’s rapids were, and is still in use today. In 1924, kayaking was introduced as a demonstration sport in Paris at the 8th Olympiad, and in 1936 the sport returned to the Berlin Olympics as a full medal sport. Whitewater slalom kayaking was later added as another Olympic sport for paddlers to compete on at the world stage. Eventually, the manufacturing of plastics brought about fiberglass which became an ideal material for the kayak, mostly due to its lightweight and durability, ensuring owners would be able to use their boats for years and years. Now that you know a little about the history of both canoes and kayaks, let us take a minute and look at the main differences between the two watercrafts in terms of their features. Single-bladed oar. A canoe is propelled using a single-bladed oar or paddle. This means paddlers must rotate from side to side when paddling a canoe, or use two oars simultaneously. Open cockpit. In a canoe, the vessel is wide open and the paddler’s legs are exposed. Wider beams. Canoes are constructed with wider beans than their kayak counterpart. Used only in calm waters. A canoe is a vessel that is used mostly on calm waters like a lake or pond. It is not made for tackling rapids and fast-moving water. Double-bladed oar. The oar or paddle that is used to propel a kayak has a blade on each side. Closed cockpit. In most cases, the area in front of the cockpit on a kayak is fully enclosed, covering the paddler’s legs. However, open vessels kayaks are also now available—these are known as sit-on-top kayaks. Streamlined design. Instead of the wide boxy design of the canoe, the kayak has a more angular and streamlined design that helps it to navigate a wide variety of waterways. Better used on rougher waters. Although a kayak can be used on calm waters, it is better designed to navigate rough and fast-moving waters. 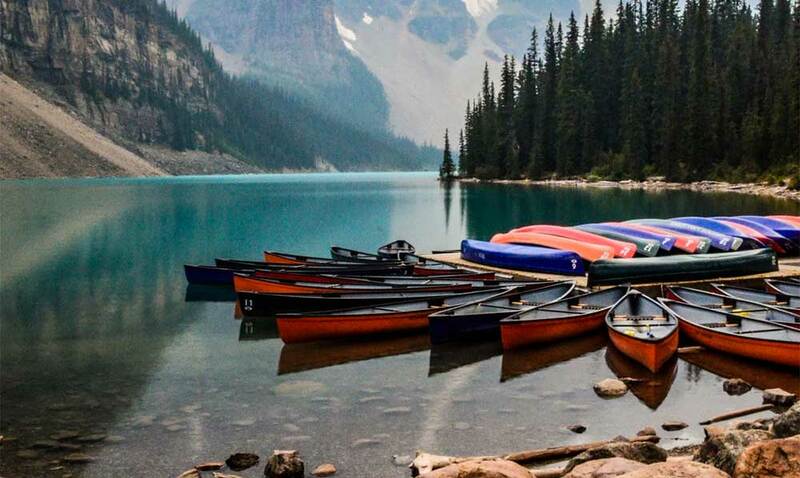 Canoes are a much better choice for calmer waters. The history of the canoe and kayak differ in terms of region and the materials used to make each of these watercraft. Canoes and kayaks were both invented for essentially the same reason: to assist with hunting and fishing as well as navigating waterways. Both canoes and kayaks can be used for recreational and commercial purposes. Of course, there are a lot of similarities when it comes to canoes and kayaks, but in terms of functionality, the main difference is the type of water each boat is suited for. Canoes do much better on calm waters than do kayaks, while kayaks are much more efficient in rough and fast-moving water. This variance in terms of function stems from the slight difference in their design. For example, the canoe’s wide beam width helps to enhance its stability on the water, but the wider frame also makes it much more difficult to steer or to rapidly make turns. Kayaks, on the other hand, are designed to be aerodynamic in the water, which adds to their speed and their maneuverability. Lastly, with their roomy open-vessel design, a canoe is the perfect vessel for fishing on calm waters or simply sightseeing, bird watching or exploring. A kayak, while it can also be used for fishing or for exploring calm waters, is built more for adventure sports, such as white water rafting, competitions and surf kayaking. The canoe is a great family vessel that is easy to learn and propel. A kayak, but because of its design, with a pocketed, covered cockpit area, requires a lot more concentration and core strength to propel and maneuver the boat efficiently.